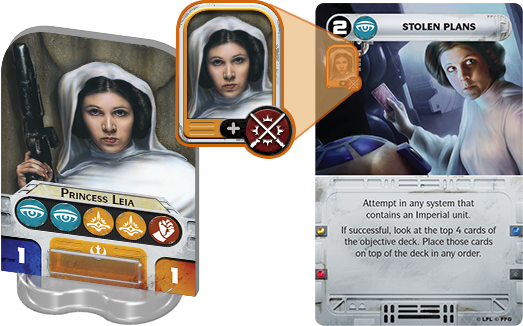 This week we'll be getting lots of looks into the upcoming Star Wars: Rebellion board game from Fantasy Flight Games. Last time we got a look at the various heroes that will help you make your way through the game. This time around, we get a better look at how those heroes interact with missions during the course of the game. This involves slipping cards from the Mission Deck and reading them aloud. Certain ones require your heroes to be at certain systems. Players then place their heroes at those systems in order to accomplish said mission. After you move your hero to the appropriate place, your opponent can choose to attempt to keep you from doing the mission by moving a hero there as well. You then roll the dice to see if you score the appropriate amount of successes (meanwhile, your opponent rolls their dice in order to stop you). The dice potentially cancel out, and you look at the results. Enough successes and the mission goes through. Of course, that's just the tip of the iceberg in terms of making your way through the game.